Former skipper Jonny Howson came back to haunt his old club as he was one of the scorers in a 2-0 win for Norwich City against Leeds United at Elland Road. Morley boy Howson was making his first appearance against Leeds at the ground where he used to watch the Whites as a kid before graduating through the ranks to become a first team regular, eventual captain and scorer of a crucial goal in the League One promotion decider. He was involved in winning a soft first half penalty that was squandered by team-mate Graham Dorrans before coming up with the crucial opening goal that settled the nerves of his team-mates who had looked anything but the promotion candidates they are before his 57th minute strike. Dorrans put the icing on the cake for Norwich in injury-time and Leeds had to face up to a fourth successive defeat and their third on the trot at home when they have only scored one goal. The Whites produced a more spirited performance than they had against Cardiff on Saturday, but rarely looked like scoring with a lack of creativity and Billy Sharp too often isolated on his own up front. Head coach Neil Redfearn made three changes, bringing Liam Cooper back in defence for Giuseppe Bellusci, with Sharp in for Mirco Antenucci and on-loan midfielder Granddi Ngoyi handed his debut in place of youngster Kalvin Phillips. There was a surprising positional change as well with Sam Byram on the left and Charlie Taylor swapped to the right, but this was an experiment that did not work and Redfearn persevered with it until taking both players off in the second half. Leeds were competitive at the start, but chances were at a premium in a first half when only one corner was won by either side to show how little goalmouth action there was. Howson did get in a dangerous low cross, but home keeper saved comfortably. The first chance was a big one for Norwich on the half-hour when Howson got in behind the Leeds defence for a moment. Cooper got back goal-side, but was then adjudged to have brought down the former United player, although there looked to be the smallest of touches and it was a harsh decision to say the least. Justice appeared to be done when Dorrans smashed his spot-kick against the crossbar. Dorrans had another chance a minute later only to fire over when free in the box to meet Nathan Redmond’s pull back. Leeds responded and Cooper’s flicked header from a free-kick was deflected onto the top of the net. Norwich looked to pick their game up after the break and Redmond’s cross-shot was beaten away by Silvestri. Alex Tettey then hit the top of the crossbar with a powerful shot from 25 yards out. The visitors did not have long to wait for their goal, however, as Redmond found Howson in space and he struck the ball sweetly with the outside of his foot for his eighth goal of the season. 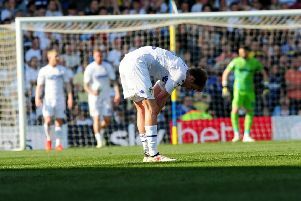 He then earned applause from sections of the Elland Road crowd when he refused to celebrate, but he had done the damage. Leeds’ response initially was good as they went straight up the other end to create their best chance of the night, but although Scott Wootton found space in the box his shot was saved by Norwich keeper John Ruddy. Norwich, though, protected their narrow lead well from this point and they still looked the more likely to score as Steven Whittaker fired wide from the edge of the box and Silvestri got down to save a low Redmond cross. The visitors had one scare six minutes from time when Ruddy had to save well to keep out Alex Mowatt’s deflected shot. But Norwich put the seal on their win late on as Cameron Jerome got away down the right with the aid of what looked like a foul and his cross found Dorrans in space to shoot past Silvestri. Leeds: Silvestri, Wootton, Bamba, Cooper, Berardi, C Taylor (Antenucci 71), Ngoyi, Murphy, Mowatt, Byram (Montenegro 85), Sharp. Norwich: Ruddy, Whittaker, Martin, Bassong, Olsson, Redmond (Hooper 86), Tettey, Dorrans, Howson, Hoolahan, Jerome.